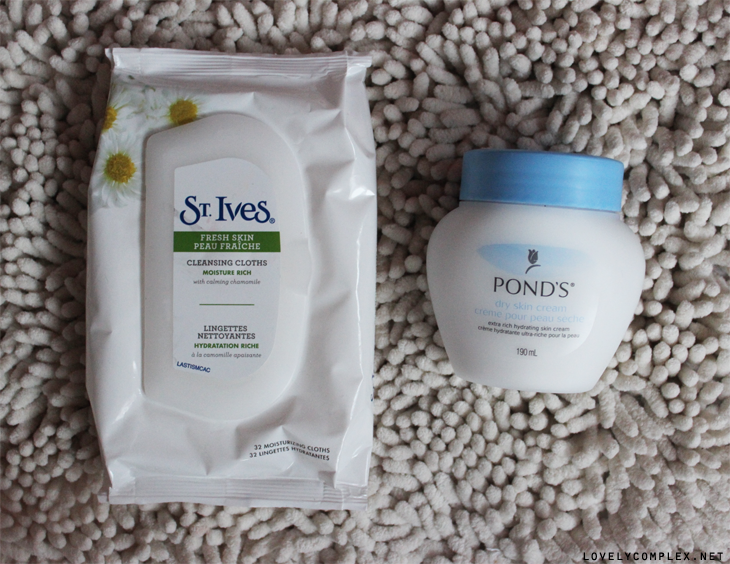 I’ve really been loving these products recently, so I thought I would make a post on the beauty/skin products that I’m currently using. 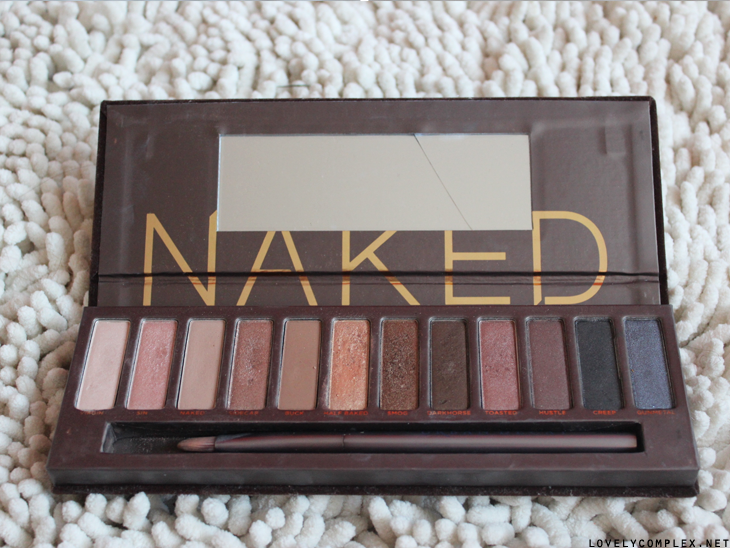 My holy grail item – the NAKED Palette (Urban Decay). I use it almost every day, whether it’s for a darker eye, or just for a sheer shimmery wash across the lids. I first discovered it through various Youtube Makeup gurus who were raving about it, but didn’t actually try it out until Sami let me see hers at Otakon! I love it, totally worth the money! Sometimes I use darkhorse and smog as liners if I want something softer than liquid liner. 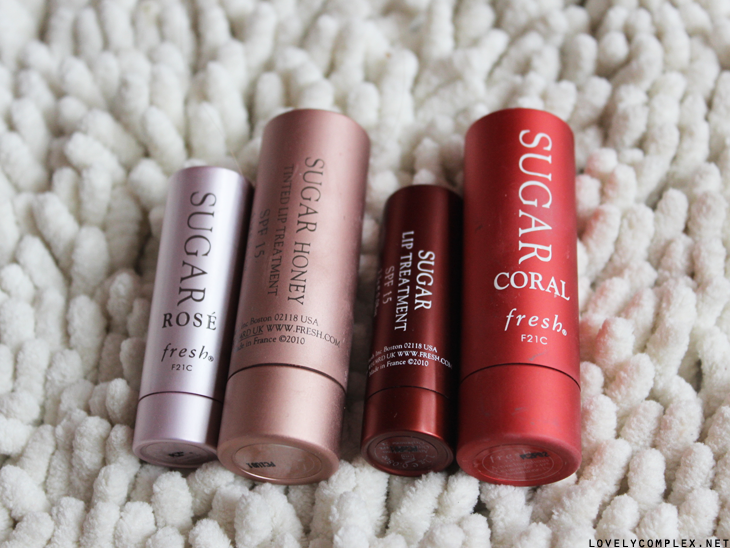 Fresh’s SUGAR lip products. 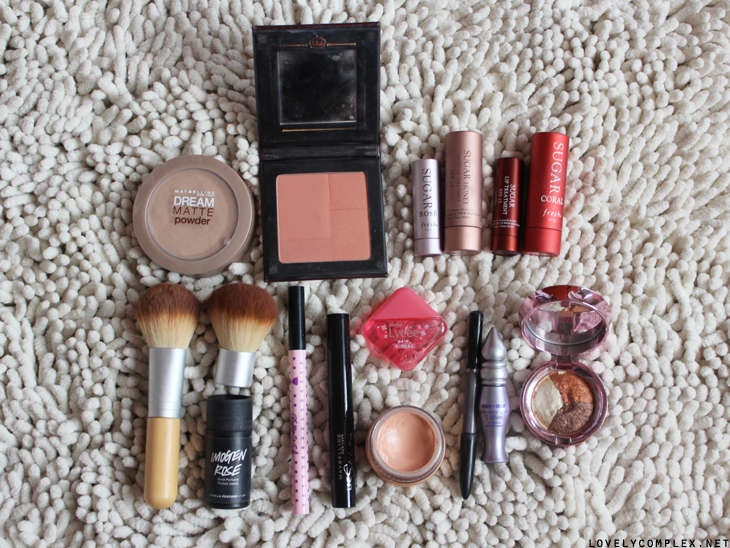 I use all of them because they are so wearable! Swatched them here. I use Rose the most because I like it the best, although I have been using the clear lip treatment (dark red tube) and patting some peach blush over the top to get a nice matte peachy lip. I’ve actually taken these pictures a while ago, so I’ve actually switched out my Maybeline Dream Matte Powder (in Sand) to my Luview Pressed Powder Compact because my skin is getting lighter for winter. Also using Imogen Rose solid perfume from LUSH quite often for a lovely rose scent. 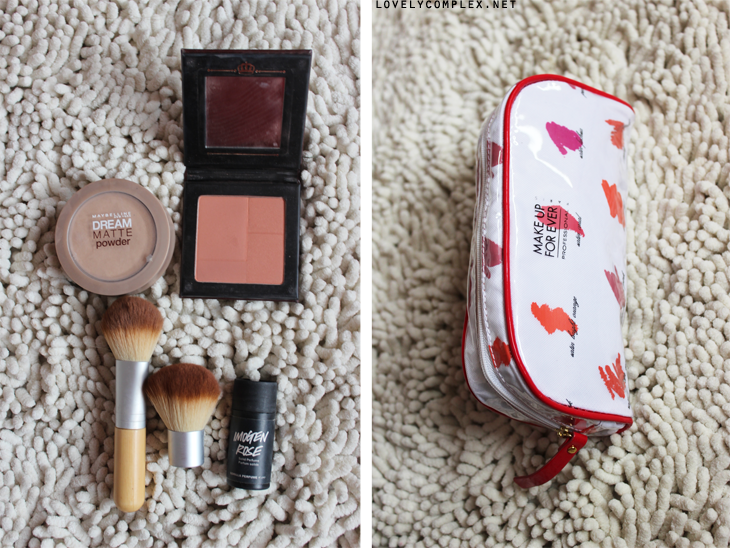 Right – my makeup bag! 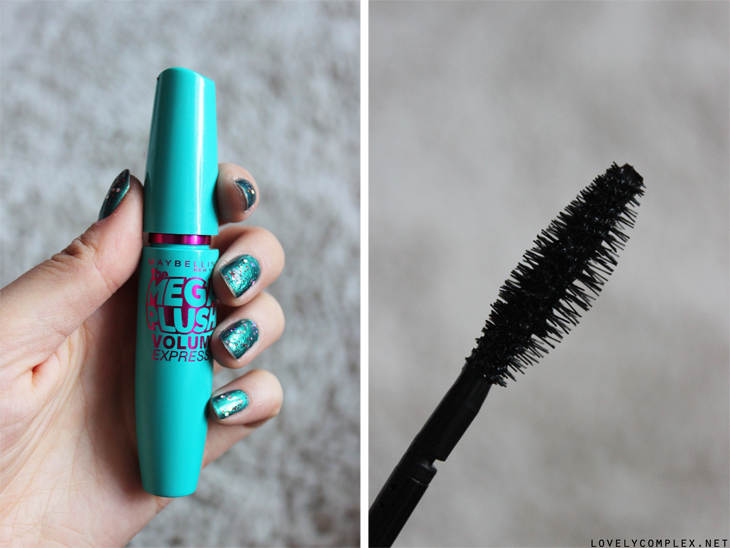 Maybelline’s Megaplush Volum’ Express Mascara. It’s great for lengthening. 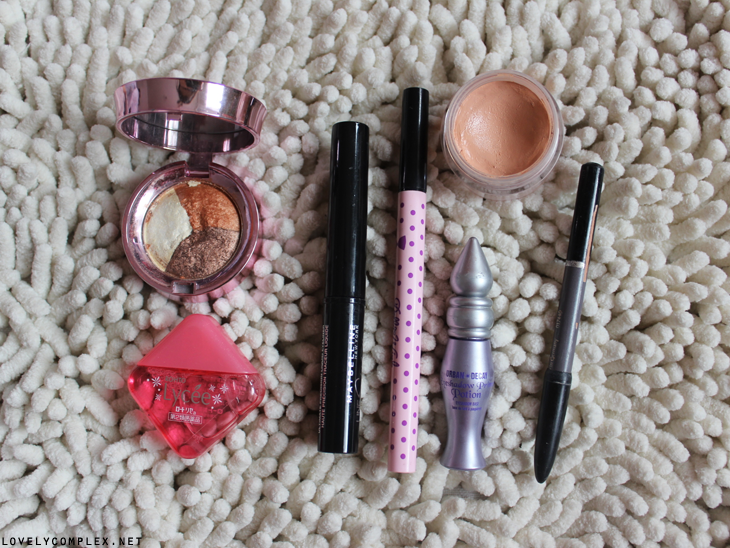 Doesn’t really volumize, but creates nice fluttery eyelashes!